Ben Foden was the architect of another Saints victory as he starred on his 250th and final appearance for the club. Foden was sin-binned just 90 seconds into the game against Worcester Warriors, but he bounced back superbly, scoring a fine try and setting another up to earn the man of the match award and a bonus-point 32-24 Aviva Premiership final-day win for his team at Franklin's Gardens. Mitch Eadie, Nafi Tuitavake and Tom Collins were also on the scoresheet as Saints recovered from an early 14-0 deficit to deliver a perfect send-off for their 17 departing players. Stephen Myler emerged from the bench to kick a last-minute penalty that provided a fitting conclusion for the fly-half and his fellow leavers. Foden, and his two children, led Saints out, but his final appearance for the club started with a yellow card inside two minutes as he was punished for a deliberate knock-on. And Worcester, having enjoyed a sustained spell of early pressure, eventually made Saints pay, with young centre Will Butler gathering an offload and sprinting over the line. Dorian Jones converted and the away side held a 7-0 advantage that was no more than they deserved after a fearless start. Worcester were finding gaps galore in the Saints rearguard and Butler was enjoying a dream first start as he latched on to a grubber kick and touched down for his second score. Jones converted again and the Gardens supporters were stunned with their side two tries down inside the first 12 minutes. But after Foden returned to the field, Saints started to rebuild and No.8 Eadie got a score that breathed new life into his team's victory bid. James Grayson kept his concentration to land the conversion and Worcester were then hit by a double injury blow as Butler and influential scrum-half Francois Hougaard were forced off at the same time. 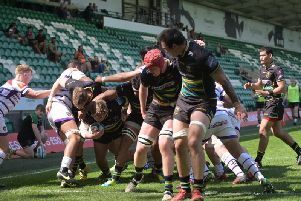 Saints were continuing to ramp up the pressure, kicking penalties to the corner as they sought to stretch the Worcester defence. But the away side held out well and eventually Grayson opted to take the points to cut the gap to four at half-time. However, Saints again came out of the blocks slowly and Worcester made them pay once again. Cobus Reinach failed to gather a bouncing ball and after good work from replacement Tom Howe, Ben Te'o finished the job. Jones converted to make it 21-10, but Saints hit back almost immediately as some good work from Piers Francis opened the door for Tuitavake to score. Grayson converted and the margin was four points once again. What was to come next was met with jubilation on the field and in the stands as Foden broke the line and skipped in for a trademark try. He was mobbed by his team-mates as cries of 'Foden, Foden, Foden' rang around the Gardens before Grayson hit the post with the conversion. Saints were now leading for the first time, at 22-21, but Worcester regained the advantage rapidly as Jones landed a penalty. But Foden was now flying for Saints and he produced a moment of inspiration, gathering the ball and racing forwards before drawing a player and offloading for Collins. The wing sped away for the score, with Grayson converting to open up a five-point lead for the home side. Grayson was replaced with 10 minutes to go as Myler drew the acclaim of the crowd as he entered the action for the 330th and final time in Saints colours. And Myler got the moment he wanted, landing the penalty that sealed the win after Worcester wing Josh Adams had been sin-binned. Myler eventually booted the ball out to end the game, bringing a roar of delight from the home fans as the season finished on a high note. Saints: Foden (c); Collins, Tuitavake (Tuala 70), Francis, North; Grayson (Myler 70), Reinach (Mitchell 66); Waller (Ma'afu 66), Haywood (Clare 66), Brookes (Hill 58); Ratuniyarawa, Craig (Ribbans 75); Gibson, Harrison, Eadie (Ludlam 66). Worcester Warriors: Pennell; Humphreys, Te'o, Butler (Howe 28), Adams; Jones, Hougaard (Arr 28); Bower (Waller 47), Singleton (Taufete'e 62), Schonert (Milasinovich ; Bresler (Kitchener 65), Barry; Mama, Lewis, van Velze (c) (Denton 65).